People who choose to live on a boat have many different reasons for doing so and it’s estimated that approximately 15,000 people in the UK live afloat. It’s not just in tranquil locations either. Many will, of course, choose to live on peaceful canals and rivers surrounded by nature and rolling countryside yet equally there are those who prefer to stay in a busy marina or harbour, live on the coast or even stay permanently moored up in the heart of some British cities which are renowned for their canal systems. There are those who prefer to predominantly stay in the same location and others who opt to travel from one place to another staying for short or longer periods of time before moving on again. Whatever their reasons, many people have said that they could not envisage going back to a conventional life of living in a house. However, these are just some of the reasons why people choose to live onboard. Some of them own their boats outright or are paying off a loan to buy it whilst others may choose to rent and, just as on land, people who become boat dwellers come from all walks of life. From young couples, families, pensioners, early retirees, boat builders and those who make their living from boating relating activities, artists and painters etc. - you are as likely to meet as diverse a range of boat dwellers as you are different types of boats. Whatever reasons people give for living on a boat, one of the things that most people will mention is that whilst it’s not all a ‘bed of roses’ all of the time and parts of life can be as humdrum and routine as they might be living in a house, a major difference is the fact that boat life gives you the opportunity to turn the ordinary into something a bit more magical. 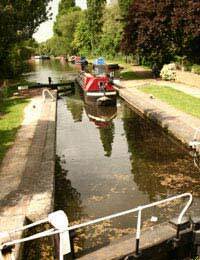 You’ll still need to wash dishes but to do that whilst looking out over a moonlit canal listening to the water gently lapping against the side of your boat is very different from doing them at home. Commuting to work (if you still work) will also seem much less stressful. Even if it’s rowing yourself ashore to catch a bus or train, or cruising straight to a mooring near to where you work than simply strolling to the office will seem very different than battling through heavy traffic in the morning and afternoon rush hours. Perhaps, for some, it’s just the appeal of getting back to basics and appreciating the simple things in life that makes boat living so special but everyone will have their own specific reasons and individual personalities which makes boat living so interesting and diverse.